"Aw man, a cliffhanger?! I hate those." For the proper reading experience, run the music from here. A commonly seen caption at the end of serial installments, especially when there's a cliffhanger. Like The End, but not so final. Contrast To Be Continued ... Right Now. This is quite notable in old Anime and Toku shows. Some modern ones still do this! One Piece fans have grown to dread the show's famous TO BE CONTINUED card, which always seems to pop up abruptly at the most suspenseful possible moment. Sometimes this is lampshaded by having it actually be part of the episode, as in one ep where the crew is on a snowy mountain; at the end of the episode, the camera suddenly pulls away to reveal someone has inexplicably written "TO BE CONTINUED" in the snow. Aside from these few variations, the card has been in non-stop use since episode 3; nearly 17 years at this time of writing. Lampshaded by Brook, who's telling his story to the Straw Hats, stopping briefly to declare "To be continued", only to be met with anger from Sanji. Sometimes the card arrived in a unique way; for example, at the end of Episode 26, when Luffy used Gum-Gum Axe on the Baratie deck, "To Be Continued" was launched into the screen by the weaves created from the impact. Another creative one is in the Enies Lobby Arc as Luffy begins his siege on the World Government fortress. He knocks a few guards away before punching at the scene which segues into the "To Be Continued" screen. When Luffy recovers after being poisoned to near-death by Magellan by being fed mountains of food, he screams "I'm better!" as the camera zooms out to show all of Impel Down; the camera then immediately hard-zooms back to Level 5.5 and into his mouth before fading to black and showing "To Be Continued", implying that he ate the cameraman. When the first half of the series was completed, rather than do the usual "To Be Continued" shot, the episode ended with "Go To New World ◊". Every episode, and in English. Even though most episodes don't end on cliffhangers. Originally in all caps, it was changed to mixed case when the show shifted to widescreen. At the end of the last episode of every "series" in Japannote Dub seasons 5, 9, and 13, it ends with "Next Time... A New Beginning!" instead. The XY series, however, ends with "And to our own way" appearing in golden letters over the sky. Edited out of most of the dub "Chronicles" episodes. The Mystery Dungeon special episodes also end this way, even though only the second one ("Time and Darkness") was continued (indirectly) by episode 3 ("Sky: Beyond Time and Darkness"). Nearly every episode of Death Note ends in a black screen, an ominous "Tsuzuku" written in the lower-right. Which Neon Genesis Evangelion did before they did. Even before that, Hideaki Anno's previous series Nadia: The Secret of Blue Water had the same ending screen. Eureka Seven featured Renton (along with Eureka during the second half) saying "To be continued" at the end of every episode, changing the effect based on the mood of the ending, so a cheerful episode would end with a happy exclamation and a sad one with a morose, doubtful murmur. The last episode finished with "The end!" After Holland pounded Renton into a Heroic BSoD, the episode ended with the sound of Eureka slamming the door. After Renton takes out military KLFs and then realizing that actual people were piloting them, the episode ended with the sound of Renton puking all over the place. Renton, I want to see you. The penultimate episode has only Renton saying "To Be Continued". In fact, the Japanese voice actors picked up the habit for the DVD commentaries. They finish off with "To be continued!" every time. Sequel Series Eureka Seven AO continues the tradition with new main character Ao saying the "To be continued" line. Like Renton, he has a different tone depending on the events of the episode. The first exception was in Episode 14, where the only thing heard was the crackling fire from Naru's attack. The second was in Episode 19 which ended with the sound of the Quartz exploding from Christophe's Heroic Sacrifice. The third was in Episode 22, due to the episode's unique ending that replaced the normal credits animation. Chrono Crusade ends every episode with a title card flashing "to be continued" on the screen, before it melts away like old, worn film and the Ending Theme starts to play. The Big O's ended stand-alone episodes with a black screen and the words "We have come to terms". For multipart episodes, the words would be "To be continued..."
In a dub example, most episodes of Yu-Gi-Oh!/Yu-Gi-Oh! GX/Yu-Gi-Oh! 5D's will end with a To Be Continued message at the end, which were not present in the original version. Episode 223 of Yu-Gi-Oh! changed this to a "To Be Concluded..." to state that the next episode was the finale. A good few episodes of Bleach end with a To Be Continued at the end of an episode. one or two episodes have even subverted this. For example, at the end of episode 27, Ichigo is by Ikkaku warned about Kenpachi, and the To Be Continued pops up over an image of Kenpachi with a sinister smile, then irises out. A few seconds later, it irises back in to a shot of a slightly bewildered Kenpachi, who has been led into another dead end by Yachiru. Episodes of Heroman end with large captions of "To Be Continued" in blocky, comic book title style text. In a lighthearted contrast with the Death Note/Evangelion/Nadia examples above, Kare Kano (also directed by Hideaki Anno, like the latter two of the aforementioned anime), sets its "To Be Continued" in red, on a white background. The end of each dubbed episode of Teknoman ended with a grating voice saying "To Be Continued", as the words themselves were shown on the screen. Cowboy Bebop: "See You Space Cowboy..."
The '90s Canadian dub added this phrase to some Sailor Moon episodes that did not originally have it. The intertitle that closes out each act of Continuity Reboot Sailor Moon Crystal has Gratuitous French phrase A Suivre at left, and a painted silhouette of an Alphonse Mucha-inspired princess at right, haloed with an outer ring of planetary signs and inner painting of the Moon Castle, accented by white lilies and stenciled doilies. One signature mark of JoJo's Bizarre Adventure is the "To be continued..." arrow pointing left at the end of every chapter when the current enemy is defeated. This became the most notable example. The Animated Adaptation uses this arrow at the end of every episode (except obviously for the final episode of a story arc). Every episode of Space Patrol Luluco ends with Luluco saying "To be continued" (directly addressing the audience at certain times), including the finale. The only exception is Episode 10, where she says "Never to be continued" due to her dying of a broken heart. Classicaloid is mainly an comedy/slice-of-life anime but it has a very slow developing story arc, which may be why every episode ends with "To be continued" screen. More notable is the fact that it features the music term "attacca", which directs a performer to go without pause to the next section. Quite fitting for a show focusing on classical music and composers. At the end of Superman Beyond 3-D, this is what Superman inscribes on the slab of stone he leaves as inspiration for the Monitors. It's not an inspiration. It's a warning. The Monitors sought to control Story itself. Superman is leaving them a pointed reminder that they'll never be able to. Not forever. Every issue of Spider-Girl ended with "To Be Continued—!" or "The End... For Now!" The series was, for 12 years, in constant danger of cancellation. First it was one issue of What If?, then a 12-issue limited series, which expanded to an ongoing. Then it was cancelled, relaunched, cancelled, incorporated in an anthology, relaunched as a miniseries, and at last a one-shot finale that was even titled "The End". It still ended with "... For Now!" In 1977 when Marvel Comics got the rights to the Hanna-Barbera characters, certain books featured a two-page teaser of another character's book with a "to be continued" tag for that other character's book. Sword Art Online Abridged does a brilliant variant of this: After the end credits of episode 11 the word "Continue?" appears on screen with a big countdown below counting down from 20 seconds. Meanwhile the camera slowly pulls back to reveal an arcade machine titled Sword Art Onine Abridged. The clock keeps counting down while the screen fades to black, and just before it should reach zero, there's the sound of a coin being inserted. 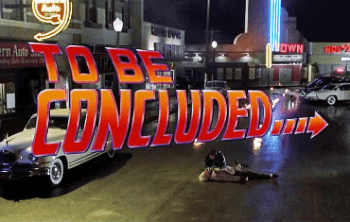 A "To be continued" card was added at the end of Back to the Future for its VHS release, and removed for the DVD release. According to the writers, they hadn't originally intended to continue the story. If they had, they wouldn't have put Jennifer in the car. Back to the Future Part II has "To be concluded". Featured in some James Bond movies. Earlier ones would end with the title of the next planned adaptation. Nowadays, they just end with "James Bond will return". Of course, these days it's a given and it's only added to the end of the credits. The Silence of the Lambs: After the Copyright notice and MPAA logo, a logo appears with the text "A Luta Continua" - Portuguese for "The Struggle Continues" ("To be continued"). Most Marvel Cinematic Universe movies have "[The hero] will return" messages at the end of the credits. It (2017): With the marketing having deliberately hidden any mention of a second film featuring an adult timeline that would imply Pennywise's return, this film makes sure to exploit the Sequel Hook as a deliberate shock for those unfamiliar with the novel. The ending title card "IT" seems to linger for just a Beat too long, and then two extra words appear: "Chapter One". Lucian's True History ends this way, claiming the adventure will be detailed in further books. Like the rest of the book, this is a lie. Doctor Who started doing this at the ends of multiparters with the beginning of the second season of the revival. The most prominent example being the end of the penultimate episode of Season 4, The Stolen Earth, in which the Doctor and Donna have finally found the Earth and along with it, the Doctor's beloved former companion Rose, who has been lost on a parallel world for the last two seasons. The pair begin running towards each other as fast as they can, leading every Doctor/Rose shipper to believe they would finally share their first kiss and the Doctor would confess his feelings to Rose at last - at which point a Dalek appears around a corner, shoots the Doctor, spoils the reunion, and forces a regeneration, shocking fans who believed David Tennant would be continuing in the role for at least another year. Needless to say, it was a hell of a cliffhanger, and therefore, unlike every other episode to date of New Who, did not feature clips of the next week's episode, only the words TO - BE - CONTINUED. By the way, the Doctor got better. The original run of the series had an implied To Be Continued at the conclusion of the majority of its episodes since a single story would span multiple episodes, usually four but sometimes as few as two or as many as twelve. Every episode of Heroes ends with "To Be Continued...". Even the volume finales ended on to be continued. "Duane Barry," "Ascension," and "One Breath" are considered part of a trilogy. "Duane Barry" ends with To Be Continued, but "Ascension" does not. This might be because the standalone episode "3" was aired and is set between "Ascension" and "One Breath," while Scully is still missing. "Gethsemane" continues into "Redux" and "Redux II," and ends with the news that Mulder has shot himself in the head. Instead of ending with To Be Continued, "Gethsemane" simply ends with a black screen for a few seconds, followed by "Executive Producer: Chris Carter." It could have been used as a means to trick the viewers at the time into thinking that Mulder really had committed suicide and that that was the final episode. Farscape used this on most of its multi-part episodes, of which there were many. But it was used most infamously on the final apisode, after a hugely dramatic moment, when the series was cancelled! Thankfully, there was a later mini-series to Wrap It Up. Word of God stated that they had the chance to edit out the cliffhanger ending, but left it in as a Take That! against Sci-Fi for backing out of a contract for a fifth season (and at the last possible moment, too). Buffy the Vampire Slayer had this a few times, with the very first episode and the two-part season 3 finale "Graduation Day". The rest tended to be more arc-based, and so they needed to either do it almost every episode, or never. Averted by Lost: Even when they have a two part episode (the season 1 and 4 finales), they never end it with "To be continued", instead just putting LOST on screen. In syndication, the two hour episodes are split up in half with "to be continued", however. Seinfeld referred to this in his act (in a two part episode). See above. Batman ended every other episode with Batman and Robin in some dangerous situation, with the narrator saying to tune in 'Same Bat Time, Same Bat Channel' to see what happens next. The iCarly episode "iOMG" has a variant where the two-producer credits don't show up at the end, indicating a "To Be Continued" vibe. Yeah, "To Be Continued"... months after that episode aired. Commander Riker: Mr. Worf... Fire. Star Trek: Deep Space Nine was the first Star Trek series to go beyond Two Part Episodes with the triple-episode arc at the beginning of season 2note "The Homecoming"/"The Circle"/"The Siege". It would go on to use an astonishing six part serial in the final months of the show, and was easily the most continuity-dependent Trek show ever aired. Despite the arc nature of the show, Burn Notice only did this once: at the end of the penultimate Season 4 episode, when Michael regains control of an extremely volatile piece of information that puts him right in the crosshairs of the organization that burned him (that previously wanted to use him instead of killing him). With the revelation that he's brought a literal war on his head, as the organization has more resources and ability to act freely than anyone he's faced, along with a now-active desire to kill him, he announces that "Tomorrow is going to be a long day", and the episode ends with the trope. Hell's Kitchen rarely does "To Be Continued" segments, and some were usually reserved for their season finales, but they had one before that in Season 6: mainly because one of the contestants wanted to try and fight the host! After that, season 10's held quite a few extra ones itself. Grimm features this in the mid-season finale of their second season. Notable in that the word "Sorry" shortly follows. The season finale has the To Be Continued followed by "Come on, you knew this was coming." The third mid-season finale end with "Oh #?$%!!!!!! ... To Be Continued"
The multi-part stories of Punky Brewster ("Punky Gets A Home," "Changes," etc.) had this. Game shows that were "straddled" (interrupted due to the end of the show) would be continued on the next show but did not use "To be continued" tags. The host would simply inform us that the game would resume on the next show. Austin & Ally has one at the end of "Chapters and Choices", but luckily this episode didn't end with "On the Next Austin and Ally", instead showing a credits scene regarding Ally's parents. Same goes with "Proms and Promises", but ends with an argument with Dez and Chuck than a "On the Next". In both cases, many Auslly shippers were annoyed at the outcome. The series' penultimate episode, "Musicals & Moving On", do also end with this trope... before the Vanity Plate shows up. And no, still no "On the next" at all. The "Previously On" for the finale doesn't even happen, but instead a repeat of the final scene before Ally continues her line from the last part of the last scene of the previous episode. In Toku shows, episodes used to end with "Tsuzuku" on the right-bottom corner of the screen, but now has been changed in current ones. Kamen Rider shows a still of the last scene with borders that best reflect the current rider (For example, in Kamen Rider OOO, a rocky border with the Core Medals that Eiji currently has). Super Sentai has a line that replaced "Tsuzuku" with "After this CM, stay tuned for the next episode preview!" (or something like it), starting with Engine Sentai Go-onger. Sentai after Ninpuu Sentai Hurricaneger but up to Juken Sentai Gekiranger just ends their episodes with the logo of the show instead. Kamen Rider Fourze 's version actually says TO BE CONTINUED in English, despite the show being in Japanese. So does Ultraman Nexus and oddly enough, Power Rangers Dino Force Brave, which is a Korean Kyoryuger sequel! Hikonin Sentai Akibaranger brings back the "Tsuzuku" part. Mighty Morphin' Power Rangers did this for its multi-part episodes. Merlin had "The Adventure Continues..."at the end of many episodes. Used on the CSI series during two-part episodes, or most of them at least. The Golden Girls also used it for two-part eps. Every episode of CBC Radio's arts show Q ends with the host saying "To be continued." At the end of the first act of Into the Woods, the narrator says "to be continued" as a beanstalk springs up behind the characters. This is the only suggestion until the second act that the ensemble's concluding declamation, "And Happily Ever After! ", is mistaken. Sweet Charity has a "TO BE CONTINUED" sign appear at the moment of Pseudo Crisis that ends the first act. MOTHER 2 finished its post-credits epilogue scene with To Be Continued. EarthBound, on the other side of the ocean, had the phrase replaced with The End?note Which turned out to be an ominously prescient move on the part of EarthBound's translators. Mother 3 played with this trope. After Lucas pulls the final Needle and the dragon wakes up, after some events, the player is left with a black screen with simply "END ?" on it. No cast, no credits. Just that. A regular player can end the game right there, HOWEVER, a more curious gamer can find out that the player has entered "the world of MOTHER 3" and can control himself/herself for the true ending. In the JoJo's Bizarre Adventure Arcade Fighting Game by Capcom, the To Be Continued sign pops up after the match ends as a Mythology Gag. The gag was carried over into JoJo's Bizarre Adventure: All Star Battle at the end of the JoJolion story, as opposed to the regular "Part Completed" screen for the previous stories. Likewise, each level in One Piece: Pirate Warriors ends with the series' classic "TO BE CONTINUED" card. The game even ends with another Mythology Gag, with "GO TO NEW WORLD" appearing instead. Diddy Kong Racing featured "To be continued" at the ending credits. It was removed however in the DS remake of the game. Appears at the end of Chapters 1-4 of Tales of Monkey Island, with each one describing the title of the next chapter. Final Fantasy XIII-2: A premiere for the series, and a quite disturbing one, since the game ends with a Bad Ending caused by a Time Crash, along with Serah dying and Lightning being reduced to a crystal stasis. Good lord. As the Main Story Quests in Granblue Fantasy get periodical updates, the game will display a message regarding "new chapters will be added" if the player has managed to catch up with the latest Main Story Chapter. In Shadowverse, this appears at the end of every leaders' arcs. Mostly when additional chapters are stated to be added in the future. Done at the end of each episode of Asura's Wrath aside from the ends of each act to make the parallels to being an interactive Anime or Japanese Drama series more obvious. Dragon Quest III, a prequel to the first Dragon Quest game, ends with the message "To be continued in Dragon Quest". The same thing happens in the Final Fantasy VII prequel Crisis Core, ending with "To be continued in Final Fantasy VII". The Super Mario World Game Mod Mushroom Kingdom Meltdown has a very... strange example of this in that the 'To be Continued' screen pops up... right after what you'd expect to be the final boss intro. Oh wait, not quite the final boss, it pops up after what should be the Disc-One Final Boss intro cutscene (what looks like half the world map is completely unexplored). Cut to credits and Tetris music. It's a bit of an anti climax, and can be seen here in raocow's video. Made more confusing by how the sequel doesn't quite continue from that point either. Seen at the end of Mega Man 6. Since Dr. Wily is behind bars and the game involved Mr. "X", some fans thought the direct sequel was Mega Man X, but the classic series later continued with Mega Man 7. Cases in the Ace Attorney series work like this. They are built like chapters, so each time the player finishes an important part of the story/investigation, they will be met with a "To Be Continued" screen, followed by a save prompt. A number of Dinamic games end on the promise of a continuation, including Army Moves, Navy Moves and Rescue from Atlantis (whose sequel was never made). Wangan Midnight Maximum Tune 2's Story Mode chapter 79, featuring Tatsuya and Koichi racing against each other, ends with "TO BE CONTINUED" rather than the usual results screen. They pick up where they left off in chapter 80.
Letters from Nowhere ends with a postmark that says "LFN - To be continued." Used frequently in the Zero Escape series, typically to denote that you've reached a critical plot point too early and need to go through at least one of the other story paths before you can continue past it. Metal Gear Solid V: The Phantom Pain uses this a few times near the end of the game's first half: once after rescuing Code Talker before the transport chopper is attacked by metallic archaea, once before Snake fights Sahalanthropus, and once after the credits role before the game's second half begins. Seen in many of the first Appisotes of Da Amazin OT Advenchr. The first appisote stated it would be continued on NOVEMBR 34TH 2069. Dead Fantasy uses this at the end of some episodes. Episodes III and IV, being released at the same time as V, simply had "Not The End" - but due to Author Existence Failure, they definitely aren't going to be continued. The first installment of Arfenhouse: the Movie plays with it. A scene towards the end gets interrupted with a Record Needle Scratch sound and "TO BE CONTINUED..." appearing, and after a pause the scene resumes. Every epiosde of EVTV Weather ends with a silly variation of the words "To Be Continued". In Kevin & Kell, any strip that indicates the start of a story arc gets a "To Be Continued..." at the end, even if the story had been going on for a few strips. Platypus Comix uses this phrase often. If the conclusion comes only a few days or weeks after the beginning, Peter Paltridge removes the phrase after the conclusion's release (most of the time). Kayda 10: There's No Place Like Poe (Part 3) : Is slightly different, using "(to be continued)", instead of "To Be Continued". Kayda 10: There's No Place Like Poe (Part 1) : Is a subversion, or something, with "END OF PART 1.". Gargoyles had "to be concluded". They also had "To be continued", spoken in a thick, Scottish burr. The Simpsons Movie subverted it. "To Be Continued... Immediately". Again in "The Simpsons Spinoff Showcase". "Chief Wiggum, P.I. will return...right now." Played straight with Part 1 of "Who Shot Mr. Burns? ", which is the only episode of the series to end with one. Used during an act break in "Separate Vocations" when Snake is about to run Bart over with his car. After the commercial break, the next segment is opened as "Act II: Death Drives a Stick," parodying the style of The Streets of San Francisco. On the animated series C.O.P.S., the first parts of the two-part episodes ended with "Case Continued" instead of the usual "Case Closed." A "To be continued" shows up in the end of the Family Guy episode "Stewie Kills Lois", which strongly resembles the Star Trek: TNG "To be continued" sign, complete with the ending music from the episode "Best of Both Worlds". One is also used in "The Thin White Line" after Brian leaves the family to go find himself. It places "To Be Continued" cards at the cliffhanger endings of the first parts of all of its two-part episodes. Humorously, though, when the episodes are originally broadcasted, the two parts are aired back-to-back, and as such the plot is continued only a few seconds afterwards. For Codename: Kids Next Door, there's "Transmission Interrupted." Though these were for one 30-minute long episode then the two short format. The episode would continue upon return from commercial break with the words "Transmission Re-established". If episodes ended with a cliffhanger, the words "Transmission To be continued". Although nearly every episode from the first season of The Avengers: Earth's Mightiest Heroes! ends on a cliffhanger, this phrase does not appear onscreen until the season finale. That episode ends with a Skrull knocking out Captain America, then becoming his double. To Be Continued on tomorrow's G.I. Joe! A "To Be Continued" showed up on a few episodes of Jem, only the ones split into parts. Garfield and Friends: Happens in "Snow Wade and the 77 Dwarfs", at the end of the first part. Season 2 through 4 of Danger Mouse, which were serialized 5-minute episodes, affected the "To be continued" tags at the end of the first four episodes of each arc. In its original CBS run (and initial syndication), The Perils of Penelope Pitstop concluded with a teaser of the next episode, followed by "To Be Continued Next Week." Cartoon Network and Boomerang runs of the show omit this altogether. Regular Show episode "Exit 9-B" surprisingly does not show any sort of "To Be Continued" card at the end of Part 1. Benson catches the gang, cut to longer-than-usual credits. The only way viewers know this is a two-parter is because the title card had "Part 1" in it. Both parts are usually broadcasted back-to-back, though. Harvey Street Kids: The Season 1 finale "The Monsters Are Due on Harvey Street" ends with a card reading "BRB" (meaning "Be Right Back").